Tamil hero Vijay’s latest movie Agent Bairavaa theatrical trailer has released today. The movie features Vijay acted in the main lead role while Keerthy Suresh is sharing the screen space with Vijay. Jagapati Babu acted in the key role for this film. The film was directed by Bharathan and bankrolled by Bellam Ramakrishna Reddy under the banner of Pusyami film makers. The music of this film composed by Santhosh Narayanan. 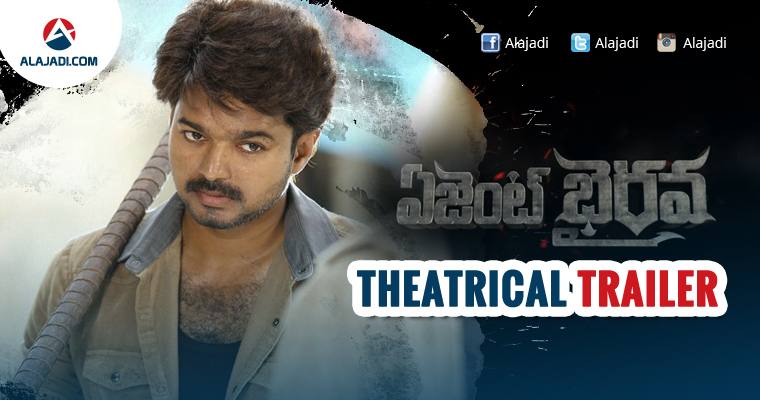 In this movie, Vijay is a collecting agent at a private bank whose job is to recover money from defaulters. He shares his room with his sidekick (Satish). Vijay meets Keerthy Suresh who had come from Tirunelveli to Chennai for her friend’s wedding and the inevitable happens. Yes, its love at first sight for him. After a dream duet song and Vijay saving Keerthy from hooligans at the Koyambedu bus terminal, the former realizes that all is not well with her. She narrates her flashback to Vijay. It is Vijay’s extraordinary screen presence and mass appeal, which helps to elevate the film to a great extent, in an otherwise inadequately etched script and unexciting presentation. Keerthy Suresh looks pretty and does what is expected out of her. Jagapathy Babu is a clichéd villain.